Potentially poisonous products such as cleaning products and medicines may put your child at risk when not used and stored safely. Even seemingly harmless products such as cosmetics need to be kept out of reach. You should always keep these important safety tips in mind when using household cleaners, medicines and other poisonous products. 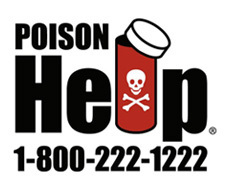 If you think your child has been poisoned, call the Poison Center Network at 1-800-222-1222 immediately. Do not wait for the child to look or feel sick and do not try to treat the child yourself. You should store food and cleaning products in separate cabinets and never together in the same area. Always keep soaps, detergents, fabric softeners, bluing agents and sprays locked away and out of reach. Anticipate your child’s skills and curiosity by moving products out from under the sink. Don’t store medicines on counter tops and bedside tables. You should clean out the medicine cabinet regularly and dispose of expired medicines in the appropriate manner. Request child safety bottles on all prescriptions. If you are interrupted while taking or dispensing medicine, take the medicine with you. It only takes a second for a child to get into medicine. Never refer to medicine as candy. Pesticides, paint, gasoline, turpentine, car and garage products locked away at all times. Only buy potentially poisonous products when necessary and in the amount needed. Never put bleach, gasoline or other poisons into containers such as a soft drink bottle or bowl that would attract a child. For more information visit Texas Poison Center Network at www.posioncontrol.org.